“I’m confused,” Tam said, staring about him. Jon gripped his brother’s hand in his unmarked one and stared at the mess around them. Ellea buried her face in her mother’s hair. Djaren submitted to the second hug for a moment, but then pulled away, to stand beside his father. Jon accepted his second round of hugs without complaint, feeling shakier now that he felt safe than he had when everything was terrible. He didn’t want to cry in front of people. “That was not a rival archeologist.” Tam stated, looking at the mess on the ground. “No,” the Professor agreed, his voice still shaky. He stared at the pieces of the rotting man. “I have enemies,” Doctor Blackfeather said. He sounded weary. Djaren looked up at him, and father and son locked eyes. “Enemies with severe leprosy?” Tam looked skeptical. Hellin was not content until she had examined the Professor herself for bullet holes. The silver armor was entirely gone, leaving no trace of its existence but the ruined bullets on the ground. Jon shrugged, suddenly nervous under so many eyes. He lifted his hand, and the silver lines on his palm lit and gleamed in the torchlight. “It tingles sometimes,” Jon said. “It was on the tomb lid, with an inscription. The writing is still there. I don’t know how to take it off. Will Ma be mad, do you think? I didn’t mean to pick it up. I’m sorry. Are you very angry, sir?” He looked up at the Professor. “He would know about things like this.” Doctor Blackfeather indicated Jon’s palm. “And I need to talk to him about how that got into a body, and found us here,” Doctor Blackfeather looked at the ground with distaste. “Sir,” Jon said. “Bad things happened to people in there,” he gestured toward the door. “I don’t know if anyone’s . . .” He trailed off. Hellin looked worried and glanced at the Doctor. He nodded at her, and then disappeared down the dark passageway. Jon blinked at her. She slipped her small hand into his, and together they processed back to the tents, and tea. Kara lagged behind, unsure, still looking at the scattered remains of the rotted man. Djaren stayed too, until the others were a little further on. Kara glanced up, alarmed, to see that the burning-eyed beautiful dark angel-turned-nobleman was standing near, a little too tall and too pale for a human, even in his current form. Doctor Blackfeather laid a hand on his son’s shoulder. Kara kept her distance from the Doctor, circling him slowly, looking for where he kept his wings. He might be pretty, but he wasn’t right. “Will he come back?” Djaren asked. “Not if I have anything to do with it,” the Doctor said. His face was grim. Kara caught the glint of unearthly green fire in his eyes. “And what are you?” she asked him. “To help tomb thieves,” Kara was skeptical. Kara frowned at the ground. “You’re not supposed to care,” she muttered. “Because if we care, you might need to?” Djaren guessed. “Shut up,” Kara told him. Kara looked up at the pale avenger dubiously. She couldn’t outrun something otherworldly with wings. She hesitated, looking from adult to adult with distrust. “You saved all our lives,” Djaren said quickly. “Then we owe you a reward,” Corin Blackfeather told Kara. “What kind?” Kara looked at him with suspicion. “Don’t you have anything stronger?” Kara asked, falling into step beside him. “We made rather a mess of the tomb, Father. I’m sorry,” Djaren said. “Oh dear,” the Professor said, overhearing, as they caught up to the waiting group. “I would rather have you in one piece than all the treasures of the Ancients,” Doctor Blackfeather said. The camp was stirring as they returned, disturbed from their night’s rest. Harl and Mama Darvin met them anxiously, and pulled Anna immediately into a mix of hugs and scoldings for not coming home for dinner. 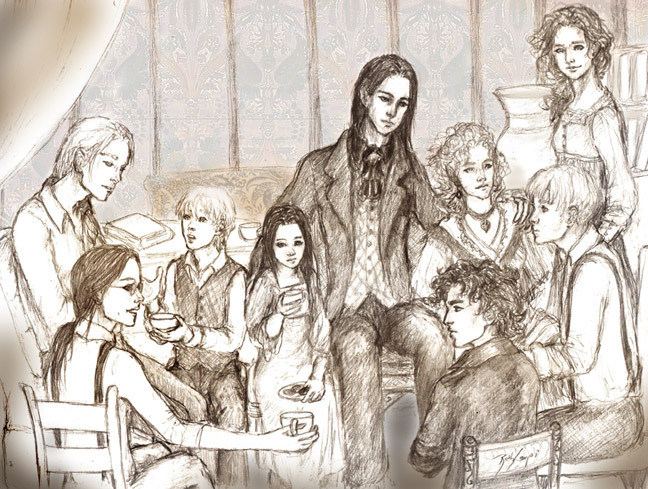 Brief explanations were given, and a late tea was assembled in the sitting room. Jon thought of the rotting man and was unsure he would ever have an appetite again. “It may only work when you really need it to. With practice, you may learn to guide it with your thoughts,” Doctor Blackfeather said. “The rotting man knew I had it,” Jon said, worried. “Do you mean it, sir?” Jon could feel a wide smile on his face. “But what he said,” Djaren objected. Doctor Blackfeather looked at Kara. She looked back suspiciously. “I would like to buy a watch from you,” he said. Kara glanced from one of the Blackfeathers to the other, and emptied her pockets, grumbling. The contents were rather amazing, and included the Professor’s pocket watch, Tam’s bag of coins, a silver-edged bookmark of Jon’s, a comb of Anna’s, and a bracelet Jon had seen a while ago on Ellea. “Did not,” Kara grumbled, pocketing the bracelet again. Kara gave Hellin a confused and dubious look. Djaren grinned, trying not to laugh. Kara shook him off. “Don’t get that thing on me.” Her look said something nicer than her words, and Jon smiled, answering that. The way this reads it could be the end of a book. Would more chapters be following as a new adventure? Oh dear, I had a broken link on the “Next” button. There is certainly more of the adventure, if only a chapter and a half. Those should all be easy to get to and readable now. The next story after this one will start being posted in a few weeks. I just need to iron out the ending, edit out of the awkward prose and give it a good shake before posting new chapters.